Pomegranate is believed to be the most royal fruit that was mentioned in several ancient doctrinal books due its everlasting health benefits. Even the fruit is majestic by its looks with beautiful ruby red seeds inside a hard, round body and a crown placed at the top. In China, pomegranate is considered as a lucky fruit, whereas in Greek it is a traditional fruit in weddings. Also, Egyptians believe that this divine fruit is eternal; therefore, they bury it with the dead bodies to make sure they don’t decompose. There are numbers of amazing health advantages that also come along with these ancient beliefs. To find out about these advantages, read on. Before discussing what pomegranate does for internal health, let’s talk about apparent benefits first. The polyphenolic compounds that are present in pomegranate keep people looking younger than their age. It slows down the process of aging by lowering the chances of free radical impairment, which proceeds to affect cells and make skin wrinkly. Vitamin C in pomegranate helps to maintain skin’s elasticity, while its antioxidants keep aging factors and skin cancer away. The skin benefits don’t end here as pomegranate also acts as a natural moisturizer and helps to exfoliate our skin. The polyphenol antioxidants in a pomegranate can help in preventing free radical damage of the arteries’ walls, hence prevent heart diseases. It also lowers bad cholesterol that helps in plaque formation and may cause coronary artery disease, and replaces it with good cholesterol. All and all, it improves blood circulation through heart, making it healthier. Adding pomegranate in your daily diet can help you lose weight as it has high antioxidants that work to cut off extra fat. It is a great substitute for people with diabetes or those who are trying to shed some pounds. Replace a high-fats and high-calories snack with a pomegranate, because it is very low in calories but high in fiber, making it a satiated for people on diet. A good immune system requires a specific amount of Vitamin C on regular basis, which can be fulfilled by a medium sized pomegranate. Its anti-inflammatory compounds are great for people who are suffering from immune disorders like osteoarthritis and rheumatoid arthritis. 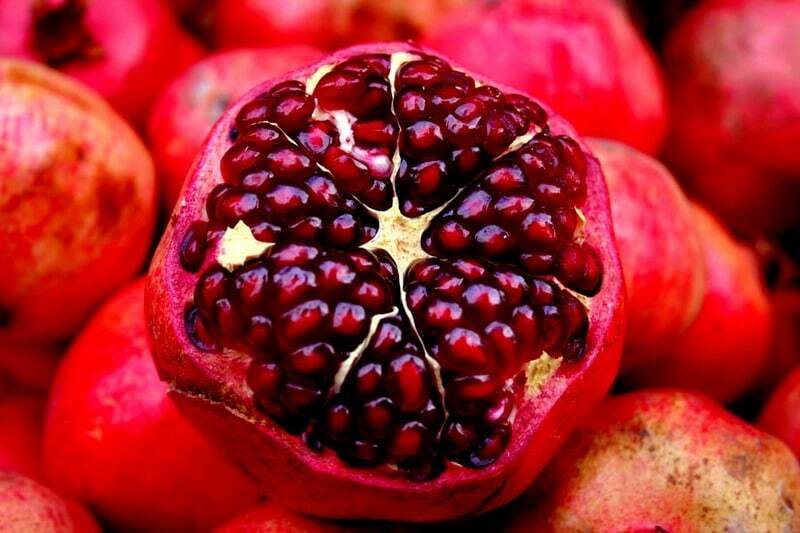 According to some other medical studies, pomegranate may also prevent coronary artery disease progression. Research suggested that pomegranate has the capability to keep Alzheimer’s disease at bay if it is taken every day. If there’s a patient who is already a victim of this disease then daily intake of pomegranate will slower the affects and help the patient to do daily activities with an improved brain. The polyphenol antioxidants present in a pomegranate also have the properties to prevent several types of cancer, including lung cancer, breast cancer, colon cancer, skin cancer, and prostate cancer. The anti-inflammatory feature also helps to keep tumor cells from producing. Daily intake of its juice is also a way to restrain the growth of cancer cells and encourage natural death. Pomegranate can make its way into our diets in different and delicious forms. One medium sized pomegranate can make our inside and out healthier. It can boost immunity, makes arteries healthy, makes bones stronger, helps regulating our blood pressure, prevents cell injuries, prevents diarrhea and dental plaque, as well as keeps our skin and hair healthy. Thus, it is known as a symbol of health as many home remedies include pomegranate as a solution to several health problems. Previous articleHow Tobacco Smoke Pollute the Air?